Norton Emery Paper Sheets designed for dry polishing or lapping of metal surfaces where heavy stock removal is not a concern. Light weight paper backing (A621). 9" x 13-3/4" sized Emery Paper sheets. 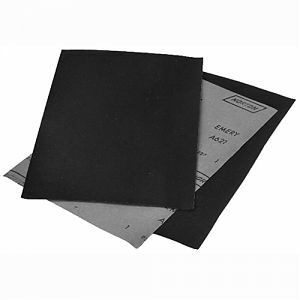 Please note, as of 5/1/11 Norton is no longer carrying Emery Paper - the closest substitute is the Magnum Black Ice Paper Sheets. Chart below is available Emery Paper left. Packaged 100 sheets per box.